Tracers is one of my favorite crime thriller slash romantic suspense series. While a lot of Laura Griffin's earlier work wasn't to my liking, I found that I slowly started becoming hooked to her Tracers series, and before I knew it, I'd read every single book available. Now I devour each book as they are published and look forward to the next, as well as keeping tabs on other projects Griffin may be creating. Granted, every so often, one of her books will come off as a regurgitation of something she's already written, with a few switch-ups, I still find myself enjoying them. Because, if it's one thing she knows how to do well, it's being able to reel the reader into a gripping, un-put-down-able suspense that has you turning pages. And also, it doesn't hurt that her characters aren't hard to relate with. A lakeside tryst turns into a double murder. Select persons of interest turn up dead as Daniele Harper is tasked to lead the investigation. Meanwhile, crucial evidence turns ballistics expert, Scott Black into the police's main suspect. Having grown up with Scott, Dani finds it hard to believe that he would commit murder, especially after finding a solid alibi for Scott's whereabouts during the killings. That means that someone is trying to frame the ex-Navy warrior. When Dani and her team learn that these killings had been planned months in advance--starting from the selection of Scott as the scapegoat--they also uncover evidence that something much deeper is happening. And as Dani's investigation leads her closer to the truth of the murders, a professional hit man might also be gunning for her life. As I'd stated, sometimes Laura Griffin books feel like they'd been written before somewhere in her back list. Fortunately, At Close Range feels like an exciting breath of fresh air, despite being another crime thriller and murder mystery in a sea of crime thrillers and murder mysteries. And also despite there being a few elements that Griffin has used before. Because we get to watch and follow very intimately as Dani and Scott uncover one piece of evidence after another, acquiring knowledge that slowly pieces the mystery together. Granted, the ending twist felt a little far-fetched, and maybe a bit over-dramatic, I still found myself flipping pages until the very end. A little before the mid-point of the book, the story becomes less of a "Whodunnit" and more of a "Why are we killing?" Because a professional hit man is uncovered, but now we need to know who hired him, what connects all of these victims, why are they all dying, and why Dani is in his cross-hairs as well. Meanwhile, we get introduced to a few new characters whom I believe will probably be featured in Griffin's next Tracers novel. One of the things I appreciate about Laura Griffin is how naturally she incorporates new characters, because the introductions don't ever feel forced for the sake of setting up back story for a new novel. Instead, Sean Byrne pulls his weight quite well as one of the police detectives working with Dani on her case. Brooke Porter, a Delphi Center forensics trace evidence tech might have already been introduced before, but I don't recall for certain. And then there are the previous characters, also included into the book quite naturally. Of course, I must point out that Ric Santos seems to keep going through partners like a new trend. Throughout the series, I think I've seen him partnered up with at least two other detectives. This is a big town and a big world after all, and I suppose you don't always see the same officers and detectives and forensic scientists, but I'd still like to know what happened to the other guys Ric had worked with previously. Daniele is a tough, smart, and resourceful detective who is given her first case as lead detective, which kind of shakes her up a little bit since she's at that "I'm not sure if I'm up for that challenge yet" stage. But that doesn't keep her from doing her job, even if it might rub others the wrong way. So I like that she maintains her level head throughout the case. Of course, except where Scott is concerned, obviously. Still, she's a great character, even if a little detached. Scott is a typical alpha male, who, unfortunately turns into a repeat of previously created male characters in Griffin's Tracers world. He's ex-military, and somehow has decided to take it upon himself to investigate the case because he doesn't feel like he can trust law enforcement to clear his name. I can understand his concerns since a crucial piece of evidence is pointing arrows at his head, but it also bothered me that Scott seemed a bit contradictory in his way of thinking. And it also bugged me that he purposefully omitted his alibi, thus impeding the investigation, forcing Dani to go on a wild goose chase to find his alibi for him--in the meantime, she could have been following a different lead. In some of his monologues, he is consistently thinking that Daniele is a great detective and will be able to handle a murder investigation--he even tells her so a couple times. But then he turns around and talks about how he'd be damned to leave this investigation in law enforcement hands because he can't trust that they'd be able to do it properly. In a round about way, that's like telling Dani to her face that he doesn't trust that she knows what she's doing so he's going to do it himself. So... I kept wondering... he either believes that she can help him by tracking down the real killer, or he doesn't. It seemed kind of frustrating that he couldn't quite make up his mind. Of course, if he weren't so arrogant about his own superior investigating skills, then we wouldn't get to see Dani and Scott in action together, figuring out significant details of the case. Meanwhile, Scott also goes a bit caveman on Dani, by pretty much telling her to sit back and let him do her job. This is something that seems to come into play a lot with a few other Laura Griffin books, and really bugs me. Daniele is a trained law enforcement officer, and lead detective of the current story line's murder case. It seems rather insulting for Scott to suggest she should "call the cops" to deal with crime, or that she should go hide somewhere while he apprehends a suspect. For some people, I'm sure it comes off manly and protective. But I simply see it as an insulting gesture wherein he cements his subconscious distrust of Dani's skills as a police detective, even as he tells her aloud that he believes in her. And so I DID like that Dani calls him out at some point in the book, when her house is broken into and she chases after the mysterious suspect. He'd told her she shouldn't have gone after the guy who broke into her home; she snaps back something to the effect of, "Should I have called the cops instead?" clearly trying to point out that she is, after all, a cop. Because given the same scenario with either of the male detectives in her place, I'm sure Scott wouldn't have bothered suggesting that said male detective NOT go after the culprit--probably would have gotten ribbed if he had stayed home obediently and dialed 911 instead. Thus is the social double standard. And also, Dani DID dial 911 and reported her break-in. She just also went after the guy while she was at it. 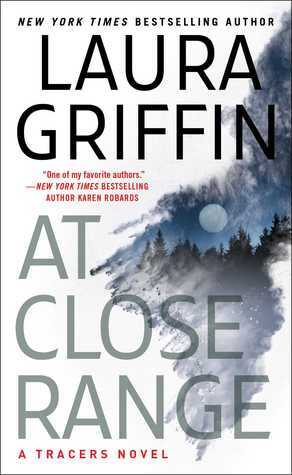 To conclude: At Close Range is an exciting, page-turning, intensely suspenseful new addition to the Tracers series. I look forward to reading the next one. I originally wanted to use this book as part of the Romance Bingo 2017 for the Blown Away square, trying to connect it with guns and shooting, as well as the explosions that happen in the book... but I decided that that would be stretching it too much.